Influenza A virus infection of C57BL/6 mice is a well-characterized model for studying CD8+ T cell-mediated immunity. Analysis of primary and secondary responses showed that the liver is highly enriched for CD8+ T cells specific for the immunodominant H2DbNP366–374 (DbNP366) epitope. Functional analysis established that these liver-derived virus-specific CD8+ T cells are fully competent cytotoxic effectors and IFN-γ secretors. In addition, flow cytometric analysis of early apoptotic cells showed that these influenza-specific CD8+ T cells from liver are as viable as those in the spleen, bronchoalveolar lavage, mediastinal lymph nodes, or lung. Moreover, cytokine profiles of the influenza-specific CD8+ T cells recovered from different sites were consistent with the bronchoalveolar lavage, rather than liver population, being the most susceptible to activation-induced cell death. Importantly, adoptively transferred influenza virus-specific CD8+ T cells from the liver survived and were readily recalled after virus challenge. Together, these results show clearly that the liver is not a “graveyard” for influenza virus-specific CD8+ T cells. Virus infections induce the expansion and differentiation of Ag-specific CD8+ T cells into mature CTLs that kill infected cells and attenuate virus spread. The Ag-primed CD8+ T cells use specific T cell receptors to lyse infected cells presenting virus-derived peptides bound to MHC-class I molecules. Following the effector phase, T cell numbers contract and >90% of the total population is eliminated (1, 2). The reduction in cell counts results from the withdrawal of survival factors, (3) and from increased levels of apoptotic signals that trigger activation-induced cell death (AICD).3 The surviving Ag-specific cells constitute the memory pool, ready and armed to combat further virus challenge. Extensive studies have identified the lymph nodes draining the site of infection as the primary location for Ag encounter and initial expansion of naive CD8+ T cells (4, 5). Following virus clearance, the spleen (6, 7) and bone marrow (7, 8, 9) become major reservoirs of Ag-specific memory cells. Early studies pointed to the liver as a site for T cell contraction (10, 11, 12, 13) that is essential for the immune system to maintain homeostasis (14). Despite this protective capacity, antiviral CD8+ T cells can also promote tissue destruction and exacerbate disease (15, 16, 17, 18), including the induction of hepatitis during influenza infection though there is no detectable viral Ag in the liver (19, 20). Accordingly, programmed contraction and exhaustion of Ag-specific CD8+ T cells during chronic infection may circumvent possible immunopathology. Pioneering work by Crispe and colleagues (12, 21, 22, 23, 24) greatly broadened knowledge of how the liver participates in immunity. The liver is continuously exposed to potential pathogens and probiotic and food-derived Ags delivered in the blood via the portal vein. This is reflected in the liver’s multifaceted capabilities, including unique tolerogenic properties (23, 25, 26), the initiation (27) and progression of immune responses against diverse pathogens, and the ability to withstand immune-mediated pathology and regenerate itself after parenchymal injury (28, 29, 30, 31). Several studies identified the liver as a major site for apoptosis and removal of functionally defective peripheral CD8+ T cells undergoing AICD (10, 24, 32, 33). Early experiments suggesting that the liver might be an “anatomical graveyard” used superantigens and Ag-driven responses in mice transgenic for a given TCR (10, 11, 33, 34, 35). However, the unnaturally high proportion of Ag-specific cells and/or high-intensity TCR stimulation in these systems does not necessarily reflect what might occur under physiological conditions. A subsequent study reported increased apoptosis and impaired function of liver CD8+ T cells specific for influenza in a nontransgenic mouse model (36). By contrast, Wang et al. (34) and others (37) reported high concentration of apoptotic LCMV-specific CD8+ T cells in the responding lymphoid tissue. Moreover, livers of mice infected with Listeria monocytogenes (LM) (38), lymphocytic choriomeningitis (39), and vesicular stomatitis virus (40) were highly enriched for functionally competent Ag-specific CD8+ T cells (38). These pathogens, however, are not as restricted to the site of infection for replication as the acute influenza infection model. This study applies contemporary technology to explore the functional status and viability of virus-specific CD8+ T cells recovered from different sites during influenza virus pneumonia. The analysis tracked apoptosis and functional profiles for CD8+ T cells specific for the immunodominant influenza A virus, DbNP366 epitope following primary and secondary infection of C57BL/6 (B6) mice. 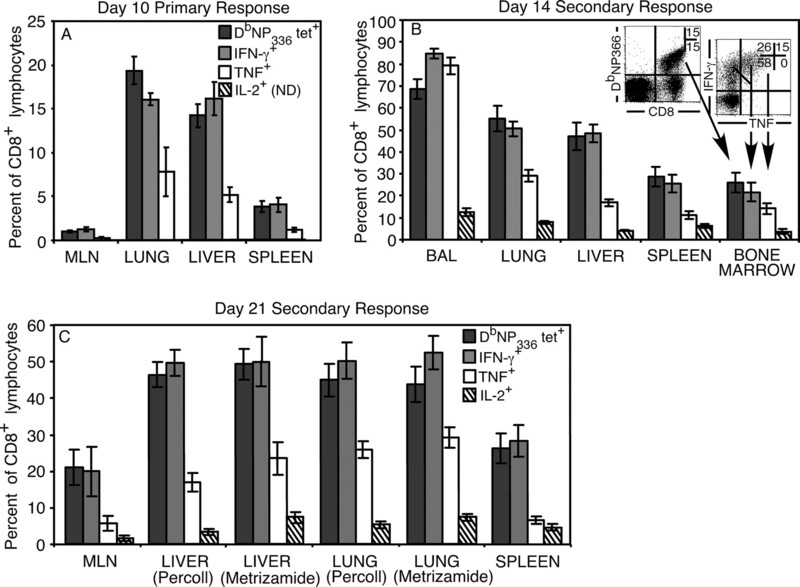 The experiments present a thorough analysis that refutes the proposed role of the liver as a site for the selective removal of dysfunctional CD8+ T cells and highlights the inflammatory population recovered by bronchoalveolar lavage (BAL) of the infected lung as the most susceptible to AICD. Female 8- to 10-wk-old C57BL/6J mice were purchased from The Jackson Laboratory and held under pathogen-free conditions at St. Jude Children’s Research Hospital. Mice were anesthetized by i.p. injection with Avertin (2,2,2-tribromethanol; prepared in-house) before intranasal (i.n.) infection. The primary response to influenza virus was analyzed following i.n. infection of naive mice with 3 × 106 egg 50% infective dose (EID50) units of the A/HKx31 (HKx31, H3N2) influenza A virus in PBS. The secondary response was analyzed in mice primed i.p. with 108.5 EID50 of A/Puerto Rico/8/34 influenza A virus (PR8; H1N1) influenza A virus, at least 8 wk before the i.n. HKx31 challenge. Mice were killed by CO2 asphyxiation or anesthetized and killed by sectioning the axillary artery. Inflammatory cells were extracted from the lung by BAL (41), and blood was recovered via cardiac puncture with a 1-ml syringe. Lungs were subsequently perfused in situ via the ventricles with 40–50 ml of PBS to remove residual blood, and the inferior vena cava was cut to allow outflow. Livers were further perfused in situ with 10–20 ml of PBS via the hepatic portal vein, and the liver, lung, spleen, and mediastinal lymph node (MLN) were excised. Cell suspensions of spleen and MLN were prepared by gently grinding organs between microscope slides into cold PBS supplemented with 2% FCS (2%-PBS). The BAL was enriched for lymphocytes by adhering macrophages to plastic at 37°C for 1 h (42). Mononuclear cells were isolated from heparinized blood using lymphocyte separation medium (ICN Pharmaceutical). Lungs and livers were rinsed in PBS, diced with scissors, and gently pushed through a 40-μm strainer with a syringe plunger (43). Lung suspensions were then washed with 40 ml of Click’s Eagle-Hanks’ amino acid medium and incubated for 30 min at 37°C in 20 ml of Click’s medium containing 50 U/ml collagenase IV and 0.001% DNase I (Sigma-Aldrich; Ref. 10). The digested lung cell suspensions were washed once in 40 ml of Click’s medium and resuspended in sterile 2%-PBS. Lung and liver lymphocytes were separated from hepatocyte nuclei and cell debris by either 1) recovery of pelleted lymphocytes using 33.8% isotonic Percoll (GE Healthcare) density gradient (44, 45, 46, 47) or 2) centrifugation over 30% metrizamide/PBS 10. Liver and lung lymphocytes were extracted using a Percoll density gradient, unless stated otherwise in the text. Single-cell suspensions were incubated for 60 min at room temperature with the allophycocyanin-conjugated DbNP366 tetramer, followed by 20-min incubation at 4°C with anti-CD8α (BD Pharmingen) and anti-mouse CD16/CD32 (clone 2.4G2) mAb (BD Pharmingen), to block nonspecific Fc-receptor-mediated binding. In all experiments, both a “no tetramer control” and a lymphocyte population from uninfected mice were included to verify the tetramer staining. All samples were washed in PBS and resuspended in 2%-PBS azide for detection of fluorochrome-labeled cells on a FACSCalibur (BD Biosciences). Data were analyzed using FlowJo software (Tree Star). The H-2Db-restricted influenza A nucleoprotein (NP)366–374 (ASNENMETM) peptide (DbNP366) was synthesized at the Hartwell Center, St. Jude Children’s Research Hospital. Lymphocytes were cultured for 5 h in a 96-well round-bottom plate at a concentration of 5−10 × 105 cells per well in 200 μl of RPMI 1640 medium (Invitrogen Life Technologies) containing the following: 10% FCS (Invitrogen Life Technologies) (RP10), 50 U/ml human rIL-2, 5 mg/ml brefeldin A (Epicentre), and either 1 μM NP366 peptide, serial dilutions of NP366 peptide for peptide titration experiments, or without peptide for unstimulated controls. After culture, cells were washed and stained with mAbs specific for CD8α and mouse CD16/CD32 (BD Pharmingen), then washed twice and fixed in 1% formaldehyde in PBS for 30 min at room temperature. After fixation, the cells were resuspended in 0.5% saponin (Sigma-Aldrich) for 10 min, incubated with fluorescently labeled anti-IFN-γ, TNF, and IL-2 (BD Pharmingen) for 30 min at 4°C, and then washed in PBS and resuspended in 2%-PBS, followed by flow cytometric analysis. Thymocytes were cultured for 3–5 days at 37°C in 6.5% CO2 with 10−6 M DEX (Sigma-Aldrich), which was diluted from a 10−3 solution stored in ethanol. Following surface labeling of recovered lymphocytes or DEX-treated thymocytes, cells were washed twice in serum-free annexin-V binding buffer (BD Pharmingen) and labeled with 50 μl of titrated FITC-conjugated annexin-V-FITC (BD Pharmingen) for 15 min at room temperature in the dark. Cells were then washed in annexin-V buffer; PI (0.6 mg/ml; Sigma-Aldrich) was added 5 min before detection on a FACSCalibur (BD Biosciences). MLN, BAL, lung, liver, and spleen cells were cultured for 6 days at 37°C in 5% CO2 in a 24-well tissue culture plate (Costar). Each well contained 106 lymphocytes and 5 × 106-irradiated (3000 rads) syngeneic splenocytes prepulsed with NP366-peptide (1 μM/ml) for 1 h at 37°C. Unlabeled splenocytes were used for “no in vitro stimulation” controls. Aliquots of MLN, BAL, lung, liver, and spleen cell suspensions were stained with the DbNP366 tetramer and anti-CD8α to determine the frequency of DbNP366-specific CD8+ T cells (effectors) by flow cytometry. The remaining cells were used in a standard 4-h chromium (51Cr) release assay (48). CTL effectors were assayed against EL4 cells pulsed with 1 μl of NP366-peptide (targets) or EL4 cells alone, as a negative control. A total of 100 μl of 1% Triton X-100 or 100 μl of RP10 was added to target cells to determine maximal and minimum release, respectively. Percentage of specific lysis was calculated by applying the following formula: percentage of specific lysis = (sample cpm-minimal release/maximal release − minimal release) × 100. Cells were washed twice in serum-free medium and resuspended at a density of 107 cells/ml in 0.1% BSA in PBS before labeling with 1 μM CFSE (Molecular Probes) for 10 min at 37°C in the dark. The reaction was stopped by adding RPMI 1640 medium containing 2.5% FCS. The cells were washed twice with HBSS and resuspended in PBS (for adoptive transfer experiments) or RP10 (for in vitro culture). Liver and splenic lymphocytes cells were recovered from Thy1.1 mice infected 10 days prior with HKx31 virus and FACS sorted for CD8+ T cells (purified to >95%). Control CD8+ spleen T cells were FACS sorted from naive Thy1.1 lymphocytes. Sorted CD8+ T cells were labeled with CFSE and an aliquot from each sample was stained with anti-CD8α and DbNP366 tetramer to calculate, then transfer 3.3 × 104 CD8-sorted DbNP366-specific, liver or spleen cells to Thy1.2 recipient mice via i.v. injection. Twenty hours later, recipient mice were infected i.n. with the HKx31 virus. After an additional 10 days, the recipient mice were killed and the MLN, BAL, lung, liver, and spleen were removed. Recovered lymphocytes were stained with DbNP366 tetramer, anti-CD8α, and anti-Thy1.1, then analyzed by flow cytometry to determine the number of influenza-specific donor cells in each organ. Quantitative differences between two samples were compared with the Mann-Whitney U (rank sum) test. A Kruskal-Wallis test was used, followed by Dunn’s post hoc test, when three or more groups were compared. Ag-specific T cells enrich selectively in the liver following i.v. injection of specific peptide into TCR transgenic mice (10) and i.p. injection of anti-CD3 (13), when Ag is presented in the liver during adenovirus infection (49) and during graft-vs-host disease-induced hepatitis (50). The frequency of influenza-specific T cells in the highly vascularized (but perfused) liver was compared with those circulating in the blood, to determine whether the liver is enriched for influenza-specific CD8+ T cells. To this end, blood- and liver-derived T cells recovered from PR8-immune (secondary) and naive (primary) mice challenged i.n. with the HKx31 virus were analyzed by flow cytometry. The influenza-specific set accumulated with similar kinetics in the blood and liver. Total CD8+ T cells were at peak prevalence on day 9, whereas the DbNP366+ population was maximal at day 10 of the primary response (Fig. 1⇓, A and B). However, the concordance in the liver and blood profiles did not persist for the later stages of the secondary response (Fig. 1⇓, C and D) suggesting that, when counts are high, influenza-specific T cells actively accumulate in the liver. Although the CD8+DbNP366+ T cells localize to the liver, lung, and BAL at approximately equivalent prevalence following secondary challenge (Fig. 2⇓A), the total number of CD8+ T cells in the liver are more equivalent to those found in the MLN or BAL (data not shown). As a consequence, the actual counts for influenza-specific T cells in the liver are relatively low (Fig. 2⇓B). Quantitative analysis of DbNP366+ CD8+ T cells during secondary influenza infection. Cells isolated following HKx31 virus infection of PR8-immune mice were analyzed for DbNP366 tetramer binding and CD8α expression. Each data point indicates the mean ± SEM percentage of DbNP366+ cells of CD8+ T cells (A) and number of DbNP366+CD8+ T cells (B), for 5–21 mice at each time point from 11 experiments. Previous reports indicated that Ag-specific CD8+ T cells in the liver are functionally compromised (10, 24, 36). Using peptide-induced IFN-γ, TNF, and IL-2 secretion (51, 52, 53) as a measure of functional capacity, the day 10 primary (Fig. 3⇓A), day 14 secondary (Fig. 3⇓B), and day 21 secondary (Fig. 3⇓C) response profiles did not suggest that the population recovered from the liver was in any sense functionally defective. In several experiments, the percentage of IFN-γ+CD8+ T cells isolated from the BAL exceeded the percentage of DbNP366 tetramer-binding cells. This may reflect an increased activation state and/or pronounced TCR down-regulation by BAL-derived cells. The proportion of CD8+DbNP366+ T cells synthesizing TNF or IL-2 did not differ significantly for the liver, spleen, and lung, indicating that the T cells have experienced a similar level of antigenic stimulation and/or experienced TCR-peptide interactions of comparable avidity (53). Functional analysis of influenza-specific CD8+ T cells via DbNP366-specific tetramer staining and cytokine synthesis. Lymphocytes isolated either 10 days after i.n. HKx31 virus challenge of naive mice (A), or 14 (B), or 21 (C) days after HKx31 virus infection of PR8-immune mice, were analyzed to determine the mean ± SEM percentage of DbNP366 tetramer+CD8+ T cells (▪). In a separate assay, DbNP366 peptide-stimulated lymphocytes were analyzed for CD8α expression and intracellular cytokine staining to determine the mean ± SEM proportion of CD8+ T cells with an IFN-γ+ (▪), TNF+ (□), or IL-2+ (▧) phenotype. Liver and lung lymphocytes were isolated with Percoll, except where metrizamide was used (as indicated in C). Data represent five mice per group, from three experiments at each time point; metrizamide and Percoll were compared twice. The isolation of lung lymphocytes via Percoll gave greater cell yields than previously reported for metrizamide (7, 36). A direct comparison was made to establish that the Percoll density gradient lymphocyte separation technique (44, 46, 49, 50, 54) was not responsible for the discrepancy between our functional analysis of liver cells and previous results obtained using metrizamide (10, 36). Lung and liver lymphocytes isolated with metrizamide were also functionally competent, with the percentage of IFN-γ+CD8+ T cells (49.8%) approximating the percentage of DbNP366 tetramer-binding cells (49.2%) (Fig. 3⇑C), demonstrating that the isolation technique did not influence the results. The number of DbNP366-specific CD8+ liver lymphocytes extracted by either method did not differ significantly, and although the lung DbNP366-specific cell counts were almost 2-fold higher using Percoll, this increase was not significant (data not shown). Together, these results indicate that the liver CD8+ T cell population contains fully functional, Ag-specific CD8+ T cells at comparable prevalence to those found in other organ sites. The preceding data indicate that the liver is enriched for fully functional influenza-specific T cells. By contrast, earlier studies based on PI staining (10, 24, 55) or end-stage apoptosis analysis with TUNEL (26, 36) concluded that the liver is a major site for CD8+ T cell elimination. These techniques are limited because they measure end-stage apoptosis by cells that are rapidly phagocytosed, and hence are not accessible for enumeration. In this study, we use PI and annexin-V to determine whether influenza-specific T cells die in the liver. Annexin-V detects phosphatidyl serine expressed very early on the surface of apoptotic cells (56) before DNA degradation, loss of membrane integrity, and complete caspase activation, whereas PI intercalates with DNA in the nucleus of necrotic and apoptotic cells with a permeable plasma membrane. This combination thus distinguishes early apoptotic (annexin+PI−) cells from necrotic or late apoptotic (annexin+PI+) cells. Early apoptosis is a preferred indicator of AICD because cells that have progressed to a PI+ phase are readily engulfed by macrophages, and thus not accessed in lymphocyte gates. Furthermore, late-stage apoptotic cells cannot be distinguished from those that are necrotic as a consequence of cellular injury rather than programmed cell death (57). Early apoptotic cells are less likely to be phagocytosed than the late apoptotic cells. Frequency calculations of these cells are therefore less biased by the number of phagocytic cells in the environment. A loose lymphocyte gate was set to include the smallest (possibly dead) cells, and DbNP366+ CD8+ cells were electronically gated (Fig. 4⇓A) and assessed for annexin-V and PI labeling (Fig. 4⇓B). Apoptosis was induced in a population of thymocytes by 2-day culture with 10−6 M DEX (58) to serve as a positive staining control (Fig. 4⇓C). Early apoptotic DbNP366+CD8+ cells were most prevalent in the MLN following primary influenza-virus challenge (Fig. 4⇓D), at a frequency significantly higher than in the liver or lung. This increased apoptosis of MLN-derived cells was less pronounced in the secondary response (Fig. 4⇓E). Controlling for isolation procedures by extracting lymphocytes from each organ with and without Percoll decreased the organ-specific differences in apoptosis. In some experiments, Percoll separation significantly reduced the frequency of preapoptotic cells (Fig. 4⇓E) though this result was variable. However, even when lymphocyte isolation techniques were controlled for all organs, there was no evidence to suggest that the liver is enriched for apoptotic, influenza-specific T cells. The response profile to peptide stimulation, termed “functional avidity” (59), purportedly reflects the sensitivity (or activation threshold) of CTL effectors. The functional capacity of liver-derived CD8+ T cells was further defined by measuring profiles of IFN-γ (Fig. 5⇓, A and B) and TNF (Fig. 5⇓, C and D) synthesis for decreasing peptide doses. Comparing the proportion of DbNP366+ cells synthesizing IFN-γ (Fig. 5⇓A) or TNF (Fig. 5⇓C) showed that the BAL-derived cells were the most potent cytokine producers at each peptide dose, although only the difference between BAL and spleen samples was significant. Furthermore, the highly activated IFN-γ+TNF+ phenotype of the BAL DbNP366-specific CD8+ T cells persisted with low peptide stimulation. It should be noted that TCR down-regulation in the highly activated BAL population may have enhanced the measured percentage of cytokine+tetramer+ cells. Despite this possibility, there was no evidence to suggest that the proportion of cytokine-producing cells is reduced in the liver subset. Comparing the proportion of cytokine-producing cells to the maximal cytokine response with the highest peptide dose indicated that the liver-derived DbNP366-specific populations were significantly less sensitive to peptide-induced IFN-γ synthesis than the BAL and lung set (Fig. 5⇓B), and less sensitive to peptide-induced TNF synthesis than the BAL effectors (Fig. 5⇓D). The functional avidity of the liver-derived T cells would therefore seem to be diminished when compared with those recovered from the BAL or lung. The previous results indicate that liver-derived CD8+ T cells are functionally capable of responding to free peptide, albeit with slightly reduced sensitivity. Is this also true for other measures of T cell effector function? The DbNP366-specific CTL response in PR8-immune mice was tested directly ex vivo on day 8, day 10 (data not shown), and day 14 (Fig. 6⇓) after HKx31 virus infection. 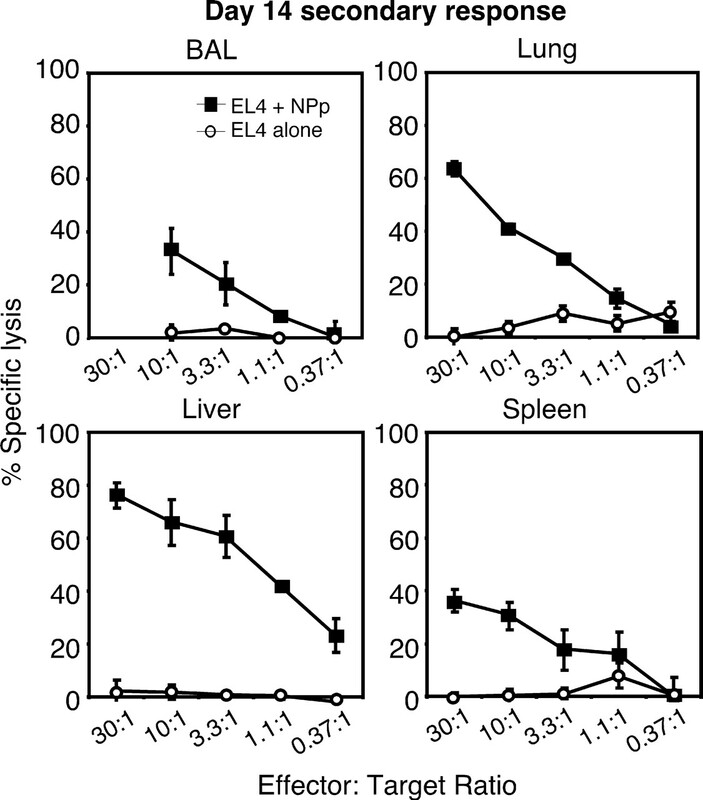 The DbNP366-specific CTL derived from the lung, liver, spleen, and BAL efficiently lysed 51Cr-labeled EL.4 cells pulsed with the DbNP366–374-peptide, whereas there was minimal lysis of unlabeled EL4 cells. At each time point, the CD8+ effectors from the liver displayed a significantly greater lytic capacity compared with their splenic and BAL-derived counterparts (Table I⇓). The results presented so far clearly demonstrate that liver DbNP366-specific CD8+ T cells are functionally competent directly ex vivo. To visualize any potential defects that may only be apparent with prolonged stimulation, the cells were assessed for proliferation and cytokine synthesis following 6-day in vitro stimulation (Fig. 7⇓B). Again, as shown for those analyzed directly ex vivo (Fig. 7⇓A), liver influenza-specific CD8+ T cells synthesized cytokines effectively following long-term in vitro culture. Interestingly, the majority of the DbNP366-specific cells synthesized TNF when stimulated in the intracellular cytokine assay after 6-day culture (Fig. 7⇓B), including those maintained in the absence of stimulating peptides (Fig. 7⇓C). This result suggests either that the cells progress to a highly activated phenotype after long-term culture, or that TNF+ cells preferentially survive under these conditions. The splenic DbNP366-specific T cells proliferated the most efficiently in vitro, with a great proportion dividing in response to stimulation (Fig. 7⇓, D and F), an effect that is likely to have contributed to the significantly greater increase in splenic (compared with liver or lung) populations following culture (Fig. 7⇓H). The average number of divisions per cell was calculated from within the divided population by applying the following formula: (Σnumber of cells at each division × number of divisions)/total number of cells. The average number of divisions per cell was similar for all organs (Fig. 7⇓G). The preceding analysis established that liver cells are functionally competent when assayed both directly ex vivo and following prolonged in vitro stimulation. Of greater significance is the question of whether they can expand and contribute to a recall challenge in vivo. To determine this, CD8+ T cells were sorted from the liver and spleen of Thy1.1 mice infected 10 days previously with the HKx31 virus, labeled with CFSE, and transferred to naive Thy1.2 recipient mice, which were subsequently infected with the HKx31 virus 20 h later. This rapid rechallenge (of the T cells) should target the CD8+ effectors cells when they are most activated and susceptible to AICD. Examination of the donor Thy1.2 DbNP366-specific cells at 10 day after rechallenge indicated that almost all of the recovered donor DbNP366-specifc CD8+ T cells from the spleen (Fig. 8⇓A) or liver (Fig. 8⇓B) had proliferated in the Thy1.2 recipients, as detected by the absence of Thy1.1 DbNP366-specific donor CFSEhigh cells. Significantly more donor spleen (vs liver) Thy1.1 DbNP366+ T cells were found in all sites, except for the liver. Despite this difference in counts, the adoptively transferred DbNP366-specific liver cells clearly expanded and contributed to the secondary influenza virus-specific response. In this study, the livers of mice infected with influenza virus were actively enriched for CD8+ T cells specific for the immunodominant DbNP366 epitope. Analysis using an array of assays showed that this population of virus-specific CD8+ T cells is functionally competent and, in contrast to previous reports, is not selectively enriched for apoptotic cells. Assessments of functional avidity and cytokine profiles following NP366 peptide stimulation were consistent with the highly activated BAL population being the most susceptible to AICD. Furthermore, the liver-derived influenza-specific CD8+ T cell population survived recall virus challenge and contributed to the secondary response. Together, these results clearly show that the liver is not the terminal endpoint for the CD8+ T cell response to influenza-virus infection, and contradicts the generalized view that it serves as a site for destruction of Ag-specific cells. In our hands, influenza-specific CD8+ T cells isolated from the liver were no more apoptotic than those isolated from the MLN, BAL, spleen, or lung. To our knowledge, this study is the first to control for organ-specific isolation techniques. Previous analysis by the TUNEL assay suggested that the CD8+ T cell population contained more apoptotic cells (36). However, these experiments were performed before tetramers became available, and an indirect inference was made from profiles for the entire CD8+ population. Additionally, it was not generally known that accurate assessment of DNA fragmentation via TUNEL staining requires prior cell culture to identify TUNEL-reactive cells. TUNEL is also limited as it measures end-stage apoptosis. Indicative of these limitations, high annexin+, but low TUNEL+ cell frequencies were recorded for the spleen of lymphocytic choriomeningitis-infected mice (34), presumably due to effective clearance of late apoptotic cells. This increased apoptosis of cells from the spleen and MLN (34), as compared with peripheral tissues, is consistent with the present findings. 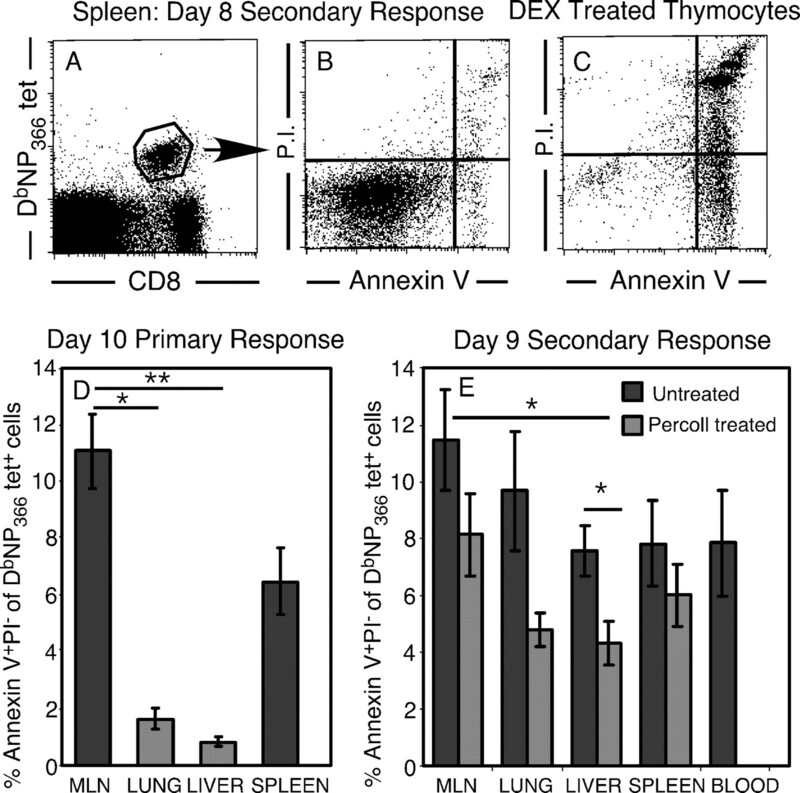 Adoptively transferred spleen and liver influenza-specific CD8+ T cells expanded and repopulated lymphoid and nonlymphoid organs following re-encounter with influenza virus. Despite their ability to proliferate, donor liver DbNP366-specific CD8+ T cells were not as prevalent as the spleen-derived population in the organs tested, with the exception of the liver. This may reflect either preferential homing of liver-derived cells to their site of initial recovery, or reduced migration of splenic cells to the liver. Earlier analysis of clonotypic distribution profiles (60) suggests that there is no TCR-related selective process that sorts acutely stimulated and/or memory T cells into different anatomical sites. Any variation in the functional states of T cell populations recovered from diverse tissue environments is therefore unlikely to reflect variations in TCR/epitope affinity at the time of Ag-induced stimulation. In a study of naive mice, transferred spleen cells, with a typically naive CD62Lhigh phenotype, homed preferentially to the spleen, whereas cells with an activated phenotype tended to migrate to the liver (61). Consistent with this finding, preliminary data suggests that liver virus-specific CD8+ T cells displayed higher expression of activation markers CD25, CD43, and CD69, which may facilitate preferential homing of liver-derived cells back to the liver. Liver-derived CD8+ T cells specific for LM (38) or vesicular stomatitis virus (62, 63) also contributed to large memory populations. Indeed, comprehensive analysis of the memory diaspora for influenza-specific CD8+ T cells indicated that specific CD8+ T cell numbers decline <2-fold between 10 and 30 days after infection (7), indicating that immune T cells may not be eliminated as rapidly as predicted (64). If the liver is not a graveyard for activated cells, this raises the question of where the immune system eventually removes the large number of specific cells that arise during an immune response. The ultimate fate of activated CD8+ T cells may resemble that of CD4+ T cells, which undergo Ag-induced cell death in the peripheral organs where they are activated (65, 66, 67, 68). It is certainly of interest that, as shown in this study, effector CTLs seem to be enriched in the liver on day 21, long after the time of virus clearance from the lung (days 6–8) (69). Analogous to our study, mice infected with LM (38), EBV, cytomegalovirus (70), and hepatitis A virus (15) showed enrichment of Ag-specific T cells within the liver CD8+ T cell population. Selective retention of activated CD8+ T cells in the liver has been attributed to trapping mediated primarily by ICAM-1 constitutively expressed on sinusoidal endothelium and Kupffer cells (13, 71). In the present analysis, the liver, lung, and BAL CD8+ populations showed similar proportions of influenza-specific T cells. Although enrichment of virus-specific cells in the lung and BAL has an obvious functional role in mediating lysis of virus-infected cells, we confirmed that influenza virus does not replicate in mouse livers (data not shown). This raises the question of the physiological benefit of such recruitment. There are indications that activation of naive CD8+ T cells is not confined to the lymph nodes; naive T cells can be primed following an encounter with Ag in the liver (27). This is unlikely in the influenza model, unless circulating Ag-presenting dendritic cells from the lung are being trapped in that site. Perhaps the accumulation of activated CD8+ T cells in the liver may contribute in immune surveillance by providing a reservoir of “early response” cells for rapid mobilization, a “minute-men” strategy. Although extensive analysis of the primary and secondary responses to influenza virus infection showed that liver-derived CD8+ T cells are functionally competent, these lymphocytes were less sensitive to peptide stimulation than the BAL set, indicative of a reduced functional avidity. As lower avidity CTLs are typically less sensitive to AICD (72, 73), this correlation suggests that liver CD8+ T cells are less susceptible to AICD than BAL-derived cells. 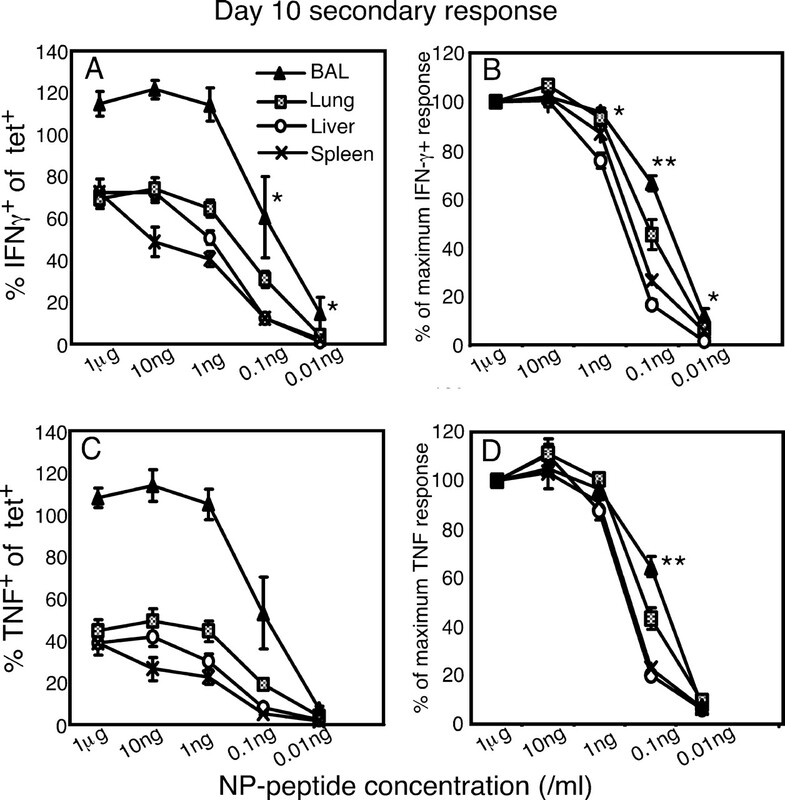 In support of a higher avidity for BAL-derived cells, the majority had an IFN-γ+TNF+ phenotype that persisted even with very low levels of stimulating peptide. Furthermore, in several experiments, the percentage of IFN-γ+ BAL cells exceeded the percentage of CD8+ DbNP366 tetramer+ cells, which may reflect pronounced TCR down-regulation, which in turn is indicative of a higher avidity interaction (74, 75). The liver populations’ reduced functional avidity or dampened sensitivity to peptide is consistent with the proposed tolerogenic role of the liver (23, 25, 26) and may help to protect against hepatic damage by activated CTL following influenza infection (20). Differences in the APC populations may have contributed to the reduced sensitivity to peptide recorded for the liver population. However, this scenario would still support a tolerogenic role for the liver. Retention of activated cells in the liver, which can repair itself after parenchymal injury (28, 29, 30, 31), may serve to protect other organs of the body from the sustained presence of activated CD8+ CTLs. Other experiments have shown that effector CD8+ T cells can transiently modulate hepatocytes, which in turn activate naive CD8+ T cells of unrelated specificities, enhance NKT cell activation, and induce the synthesis of cytokines that can promote both innate and adaptive immune responses (76). Thus, communication with innate immunity may help to spread a “defense” alarm and also provide a further mechanism to dampen hepatic injury by activated CD8+ T cells (77, 78). The liver is thus enriched for influenza-specific CD8+ T cells that are viable and functionally competent. Although this finding is hardly revolutionary, it contradicts the theory of the liver as a graveyard, which was otherwise supported by a previous study of the CD8+ T cell response to influenza infection (36). Although any hepatitis associated with influenza in humans is usually mild and self-limiting, influenza virus infection can exacerbate chronic liver disease and trigger allograft rejection (19). Furthermore, exposure to highly pathogenic strains of influenza virus, or vaccines incorporating CD8+ T cell epitopes, may aggravate pre-existing hepatitis or induce severe hepatitis. Given the fact that there is no influenza virus in the liver, the nature of the possible mechanism is intriguing. Understanding the influence of liver CD8+ T cells may lead to therapeutic measures to manipulate the immune response to influenza virus and other pathogens to minimize possible immunopathological consequences of secondary disease states. We thank Scott Brown for technical assistance and Richard Cross and Jennifer Smith for cell sorting and assistance in flow cytometry. ↵1 This work was supported by Grants AI170251 and AI065097 and by ALSAC at St. Jude Children’s Research Hospital. P.C.D. is also a Burnet Fellow of the Australian National Health and Medical Research Council. ↵3 Abbreviations used in this paper: AICD, activation-induced cell death; LM, Listeria monocytogenes; BAL, bronchoalveolar lavage; i.n., intranasal(ly); EID50, egg 50% infective dose; PR8, A/Puerto Rico/8/34 influenza A virus; MLN, mediastinal lymph node; NP, nucleoprotein; DEX, dexamethasone; PI, propidium iodide. Zimmerman, C., K. Brduscha-Riem, C. Blaser, R. M. Zinkernagel, H. Pircher. 1996. Visualization, characterization, and turnover of CD8+ memory T cells in virus-infected hosts. J. Exp. Med. 183: 1367-1375. Deng, G., E. R. Podack. 1993. Suppression of apoptosis in a cytotoxic T-cell line by interleukin 2-mediated gene transcription and deregulated expression of the protooncogene bcl-2. Proc. Natl. Acad. Sci. USA 90: 2189-2193. Deckhut, A. M., W. Allan, A. McMickle, M. Eichelberger, M. A. Blackman, P. C. Doherty, D. L. Woodland. 1993. Prominent usage of Vβ 8.3 T cells in the H-2Db-restricted response to an influenza A virus nucleoprotein epitope. J. Immunol. 151: 2658-2666. McMichael, A. J., C. A. O’Callaghan. 1998. A new look at T cells. J. Exp. Med. 187: 1367-1371. Slifka, M. K., J. K. Whitmire, R. Ahmed. 1997. Bone marrow contains virus-specific cytotoxic T lymphocytes. Blood 90: 2103-2108. Parretta, E., G. Cassese, P. Barba, A. Santoni, J. Guardiola, F. Di Rosa. 2005. CD8 cell division maintaining cytotoxic memory occurs predominantly in the bone marrow. J. Immunol. 174: 7654-7664. Wack, A., P. Corbella, N. Harker, I. N. Crispe, D. Kioussis. 1997. Multiple sites of post-activation CD8+ T cell disposal. Eur. J. Immunol. 27: 577-583. Crispe, I. N., W. Z. Mehal. 1996. Strange brew: T cells in the liver. Immunol. Today 17: 522-525. Van Parijs, L., A. K. Abbas. 1998. Homeostasis and self-tolerance in the immune system: turning lymphocytes off. Science 280: 243-248. Fleischer, B., S. Fleischer, K. Maier, K. H. Wiedmann, M. Sacher, H. Thaler, A. Vallbracht. 1990. Clonal analysis of infiltrating T lymphocytes in liver tissue in viral hepatitis A. Immunology 69: 14-19. Nakamoto, Y., L. G. Guidotti, C. V. Kuhlen, P. Fowler, F. V. Chisari. 1998. Immune pathogenesis of hepatocellular carcinoma. J. Exp. Med. 188: 341-350. Bertoletti, A., M. Maini, R. Williams. 2003. Role of hepatitis B virus specific cytotoxic T cells in liver damage and viral control. Antiviral Res. 60: 61-66. Maini, M. K., C. Boni, C. K. Lee, J. R. Larrubia, S. Reignat, G. S. Ogg, A. S. King, J. Herberg, R. Gilson, A. Alisa, et al 2000. The role of virus-specific CD8+ cells in liver damage and viral control during persistent hepatitis B virus infection. J. Exp. Med. 191: 1269-1280. Duchini, A., R. M. Hendry, D. C. Redfield, P. J. Pockros. 2000. Influenza infection in patients before and after liver transplantation. Liver Transpl. 6: 531-542. Polakos, N. K., J. C. Cornejo, D. A. Murray, K. O. Wright, J. J. Treanor, I. N. Crispe, D. J. Topham, R. H. Pierce. 2006. Kupffer cell-dependent hepatitis occurs during influenza infection. Am. J. Pathol. 168: 1169-1178. Crispe, I. N., T. Dao, K. Klugewitz, W. Z. Mehal, D. P. Metz. 2000. The liver as a site of T-cell apoptosis: graveyard, or killing field?. Immunol. Rev. 174: 47-62. Park, S., D. Murray, B. John, I. N. Crispe. 2002. Biology and significance of T-cell apoptosis in the liver. Immunol. Cell Biol. 80: 74-83. Crispe, I. N.. 2003. Hepatic T cells and liver tolerance. Nat. Rev. Immunol. 3: 51-62. Huang, L., I. N. Crispe. 1993. Superantigen-driven peripheral deletion of T cells: apoptosis occurs in cells that have lost the αβ T cell receptor. J. Immunol. 151: 1844-1851. Bertolino, P., G. Klimpel, S. M. Lemon. 2000. Hepatic inflammation and immunity: a summary of a conference on the function of the immune system within the liver. Hepatology 31: 1374-1378. Mehal, W. Z., F. Azzaroli, I. N. Crispe. 2001. Antigen presentation by liver cells controls intrahepatic T cell trapping, whereas bone marrow-derived cells preferentially promote intrahepatic T cell apoptosis. J. Immunol. 167: 667-673. Bowen, D. G., M. Zen, L. Holz, T. Davis, G. W. McCaughan, P. Bertolino. 2004. The site of primary T cell activation is a determinant of the balance between intrahepatic tolerance and immunity. J. Clin. Invest. 114: 701-712. Fausto, N.. 2000. Liver regeneration. J. Hepatol. 32: 19-31. Sandgren, E. P., R. D. Palmiter, J. L. Heckel, C. C. Daugherty, R. L. Brinster, J. L. Degen. 1991. Complete hepatic regeneration after somatic deletion of an albumin-plasminogen activator transgene. Cell 66: 245-256. Rhim, J. A., E. P. Sandgren, J. L. Degen, R. D. Palmiter, R. L. Brinster. 1994. Replacement of diseased mouse liver by hepatic cell transplantation. Science 263: 1149-1152. Overturf, K., M. al-Dhalimy, C. N. Ou, M. Finegold, M. Grompe. 1997. Serial transplantation reveals the stem-cell-like regenerative potential of adult mouse hepatocytes. Am. J. Pathol. 151: 1273-1280. Crispe, I. N.. 1994. CD4/CD8-negative T cells with αβ antigen receptors. Curr. Opin. Immunol. 6: 438-441. Crispe, I. N.. 1999. Death and destruction of activated T lymphocytes. Immunol. Res. 19: 143-157. Wang, X. Z., S. E. Stepp, M. A. Brehm, H. D. Chen, L. K. Selin, R. M. Welsh. 2003. Virus-specific CD8 T cells in peripheral tissues are more resistant to apoptosis than those in lymphoid organs. Immunity 18: 631-642. Russell, J. Q., G. J. Morrissette, M. Weidner, C. Vyas, D. Aleman-Hoey, R. C. Budd. 1998. 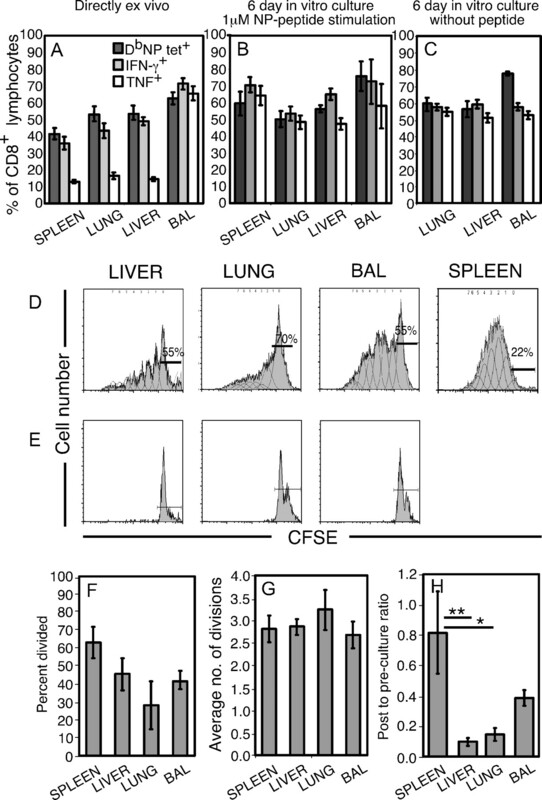 Liver damage preferentially results from CD8+ T cells triggered by high affinity peptide antigens. J. Exp. Med. 188: 1147-1157. Belz, G. T., J. D. Altman, P. C. Doherty. 1998. Characteristics of virus-specific CD8+ T cells in the liver during the control and resolution phases of influenza pneumonia. Proc. Natl. Acad. Sci. USA 95: 13812-13817. Koniaras, C., S. R. Bennett, F. R. Carbone, W. R. Heath, A. M. Lew. 1997. Peptide-induced deletion of CD8 T cells in vivo occurs via apoptosis in situ. Int. Immunol. 9: 1601-1605. Goossens, P. L., H. Jouin, G. Marchal, G. Milon. 1990. Isolation and flow cytometric analysis of the free lymphomyeloid cells present in murine liver. J. Immunol. Methods 132: 137-144. Bertolino, P., W. R. Heath, C. L. Hardy, G. Morahan, J. F. Miller. 1995. Peripheral deletion of autoreactive CD8+ T cells in transgenic mice expressing H-2Kb in the liver. Eur. J. Immunol. 25: 1932-1942. Hammond, K., W. Cain, I. van Driel, D. Godfrey. 1998. Three day neonatal thymectomy selectively depletes NK1.1+ T cells. Int. Immunol. 10: 1491-1499. Pellicci, D. G., K. J. Hammond, A. P. Uldrich, A. G. Baxter, M. J. Smyth, D. I. Godfrey. 2002. A natural killer T (NKT) cell developmental pathway involving a thymus-dependent NK1.1− CD4+ CD1d-dependent precursor stage. J. Exp. Med. 195: 835-844. Carbone, F. R., M. W. Moore, J. M. Sheil, M. J. Bevan. 1988. Induction of cytotoxic T lymphocytes by primary in vitro stimulation with peptides. J. Exp. Med. 167: 1767-1779. Liu, Z. X., S. Govindarajan, S. Okamoto, G. Dennert. 2001. Fas-mediated apoptosis causes elimination of virus-specific cytotoxic T cells in the virus-infected liver. J. Immunol. 166: 3035-3041. Sato, T., H. Thorlacius, B. Johnston, T. L. Staton, W. Xiang, D. R. Littman, E. C. Butcher. 2005. Role for CXCR6 in recruitment of activated CD8+ lymphocytes to inflamed liver. J. Immunol. 174: 277-283. Lalvani, A., R. Brookes, S. Hambleton, W. J. Britton, A. V. Hill, A. J. McMichael. 1997. Rapid effector function in CD8+ memory T cells. J. Exp. Med. 186: 859-865. Bachmann, M. F., M. Barner, A. Viola, M. Kopf. 1999. Distinct kinetics of cytokine production and cytolysis in effector and memory T cells after viral infection. Eur. J. Immunol. 29: 291-299. La Gruta, N. L., S. J. Turner, P. C. Doherty. 2004. Hierarchies in cytokine expression profiles for acute and resolving influenza virus-specific CD8+ T cell responses: correlation of cytokine profile and TCR avidity. J. Immunol. 172: 5553-5560. Huang, L., K. Sye, I. N. Crispe. 1994. Proliferation and apoptosis of B220+CD4−CD8− TCRαβ intermediate T cells in the liver of normal adult mice: implication for lpr pathogenesis. Int. Immunol. 6: 533-540.
van Engeland, M., L. J. Nieland, F. C. Ramaekers, B. Schutte, C. P. Reutelingsperger. 1998. Annexin V-affinity assay: a review on an apoptosis detection system based on phosphatidylserine exposure. Cytometry 31: 1-9. Vermes, I., C. Haanen, C. Reutelingsperger. 2000. Flow cytometry of apoptotic cell death. J. Immunol. Methods 243: 167-190. Purton, J. F., R. L. Boyd, T. J. Cole, D. I. Godfrey. 2000. Intrathymic T cell development and selection proceeds normally in the absence of glucocorticoid receptor signaling. Immunity 13: 179-186. Klugewitz, K., F. Blumenthal-Barby, K. Eulenburg, M. Emoto, A. Hamann. 2004. The spectrum of lymphoid subsets preferentially recruited into the liver reflects that of resident populations. Immunol. Lett. 93: 159-162. Masopust, D., J. Jiang, H. Shen, L. Lefrancois. 2001. Direct analysis of the dynamics of the intestinal mucosa CD8 T cell response to systemic virus infection. J. Immunol. 166: 2348-2356. Tough, D. F., S. Sun, X. Zhang, J. Sprent. 1999. Stimulation of naive and memory T cells by cytokines. Immunol. Rev. 170: 39-47. Kawabe, Y., A. Ochi. 1991. Programmed cell death and extrathymic reduction of Vβ8+ CD4+ T cells in mice tolerant to Staphylococcus aureus enterotoxin B. Nature 349: 245-248. Renno, T., M. Hahne, H. R. MacDonald. 1995. Proliferation is a prerequisite for bacterial superantigen-induced T cell apoptosis in vivo. J. Exp. Med. 181: 2283-2287. Liblau, R. S., R. Tisch, K. Shokat, X. Yang, N. Dumont, C. C. Goodnow, H. O. McDevitt. 1996. Intravenous injection of soluble antigen induces thymic and peripheral T-cells apoptosis. Proc. Natl. Acad. Sci. USA 93: 3031-3036. Ward, S. M., J. R. Jonsson, S. Sierro, A. D. Clouston, M. Lucas, A. L. Vargas, E. E. Powell, P. Klenerman. 2004. Virus-specific CD8+ T lymphocytes within the normal human liver. Eur. J. Immunol. 34: 1526-1531. Bertolino, P., A. Schrage, D. G. Bowen, K. Klugewitz, S. Ghani, K. Eulenburg, L. Holz, N. Hogg, G. W. McCaughan, A. Hamann. 2005. Early intrahepatic antigen-specific retention of naive CD8+ T cells is predominantly ICAM-1/LFA-1 dependent in mice. Hepatology 42: 1063-1071. Alexander-Miller, M. A., G. R. Leggatt, A. Sarin, J. A. Berzofsky. 1996. Role of antigen, CD8, and cytotoxic T lymphocyte (CTL) avidity in high dose antigen induction of apoptosis of effector CTL. J. Exp. Med. 184: 485-492. Derby, M. A., J. T. Snyder, R. Tse, M. A. Alexander-Miller, J. A. Berzofsky. 2001. An abrupt and concordant initiation of apoptosis: antigen-dependent death of CD8+ CTL. Eur. J. Immunol. 31: 2951-2959. Nugent, C. T., D. J. Morgan, J. A. Biggs, A. Ko, I. M. Pilip, E. G. Pamer, L. A. Sherman. 2000. Characterization of CD8+ T lymphocytes that persist after peripheral tolerance to a self antigen expressed in the pancreas. J. Immunol. 164: 191-200. Dikopoulos, N., U. Wegenka, A. Kroger, H. Hauser, R. Schirmbeck, J. Reimann. 2004. Recently primed CD8+ T cells entering the liver induce hepatocytes to interact with naive CD8+ T cells in the mouse. Hepatology 39: 1256-1266. Li, B., R. Sun, H. Wei, B. Gao, Z. Tian. 2006. Interleukin-15 prevents concanavalin A-induced liver injury in mice via NKT cell-dependent mechanism. Hepatology 43: 1211-1219. Suzuki, A., S. McCall, S. S. Choi, J. K. Sicklick, J. Huang, Y. Qi, M. Zdanowicz, T. Camp, Y. X. Li, A. M. Diehl. 2006. Interleukin-15 increases hepatic regenerative activity. J. Hepatol. 45: 410-418.